Come to us for quality & friendly catering services! If you have an upcoming event, let us take a load off of your shoulders. Planning a party or celebration can be a great deal of work and we understand this. Instead of stressing over yet another aspect of party-planning, give us a task to take the weight off of your shoulders. PoPo Family Restaurant offers catering service, which our professional and friendly staff has plenty of experience doing! Our catering restaurant not only provides the food at your event, but also strives to take added stress off of you, so you can focus on other aspects of the party. If we take care of the food, that frees up more of your time to actually go out and enjoy the wonderful party you put so much time into planning! When it comes to these planned events, what’s really important is who is there and what you are all celebrating. That being the case, we want to liberate your time and responsibilities so you can enjoy the party for all it is worth, rather than solely focusing on running it. Leave the work to PoPo Family Restaurant and we’ll leave the partying to you. Our restaurant has a plethora of menu selections. Have you been having a constant craving that you just can’t seem to kick away? All of us at Popo Family Restaurant are confident that we can serve you something to satisfy every single one of your taste buds. We have great starter plates, like PoPo potato skins, frog legs, fresh fried mozzarella and so much more. If you are going for a more nutritional dish, we toss fresh salads, such as grilled chicken Caesar Salad and others. We also a have a soup of the day that you can choose! For lunch, you can indulge in a classic soup and sandwich combo or add a side like a loaded baked potato. If you are not hungry enough for a full entrée, our lunch menu also offers 1/3 hamburger — 1/3 cut Angus beef patty with your choice of toppings served with French fries, onion rings or steak fries as a side. We have a vibrant selection of steaks, seafood dishes, different seasoned chickens and other traditional American dishes and classic Southern comfort food to choose from. When it comes to your choice of chicken, you get to choose exactly what kind of meat you want — white or dark meat and if you’d just like a half chicken for a smaller appetite. Find out for yourself just how great our food really is when you stop by. You won’t be disappointed! 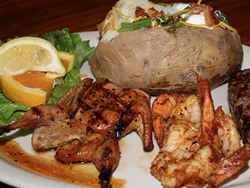 If we have your mouth watering, just wait until your plate is right in front of you. We bet it will be even better than you are expecting. Give yourself a break today and let us prepare your meal.